Looking at this analysis of which microbes are active in a spontaneous lambic fermentation, it’s hard to see why Brettanomyces gets so much attention. There are dozens of different species of yeast and bacteria at work over the course of several years. From a sensory standpoint it is clear they have an out-sized influence over the finished beer, but they are one of many yeast that play a role in the fermentation. Just as 100% Brett beers have gained interest, recently so have 100% fermentations by other non-Saccharomyces yeast strains. In particular there has been interest in yeast strains that produce lactic acid. This is a big deal as in almost all sour beers up until now it is bacteria (i.e., Lactobacillus or Pediococcus) that were responsible for acidification. There are a litany of potential advantages to a lactic-acid producing yeast: simplicity of maintaining a pure culture, reducing concerns about cross-contamination, and hop-tolerance. Luckily for me, I contacted Dr. Matt Bochman of Wild Pitch Yeast and he sent samples of two strains to trial, YH72 (Hanseniaspora vineae) and YH82 (Wickerhamomyces anomalus). I wanted to try the two strains both in a relatively clean base beer, and a beer with aroma hops to take advantage of their hop-tolerance. To accomplish this I ran off two gallons of the wort post-boil through my plate-chiller. I then sent additional cooled wort back into the kettle, lowering the wort to 175F for the whirlpool addition of Mosaic and Amarillo. I haven’t found that a cooler whirlpool retains more hop aroma than one at flame-out, but it does reduce isomerization. While the yeast were billed as not minding iso-alpha acids, from a flavor-standpoint intense sour and bitter don’t get along. Hanseniaspora's anamorph (asexual) form is Kloeckera; in the past Vinnie Cilurzo credited K. apiculata with providing grapefruit notes to Russian River Beatification. 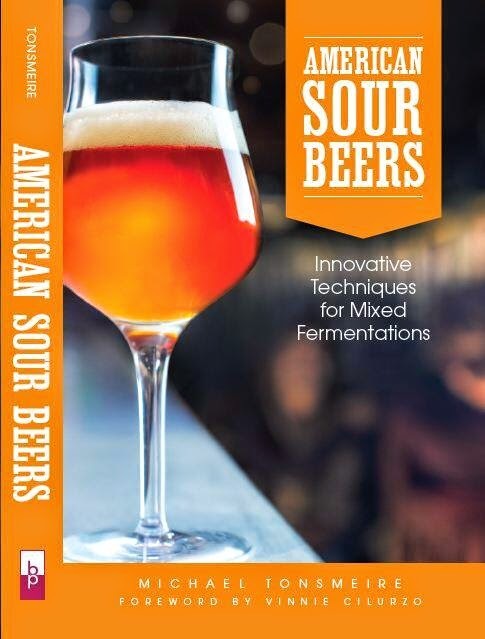 Eureka Brewing has a comprehensive write-up about the species. Given that it can't ferment maltose, it wouldn't be effective for solo-fermentation. Luckily Hanseniaspora vineae seems to be able to ferment wort well enough (reaching 71% apparent attenuation in my tests). There is also some interesting research on H. vineae's role in wine where it produced a "more fruity and flowery wine... strong presence of phenyl ethyl acetate." This ester is described as having an aroma like rose, raspberry, floral, and honey. Wickerhamomyces is interesting because it is positive for beta-glucosidase (source), killer yeast toxins (potentially to control malaria). Here is a post about glycosides I did from a couple years ago. Wickerhamomyces is also available with several other oxidative yeasts in East Coast Yeast ECY31 Senne Valley Blend. While the hoppy portions eventually finished out at the same FGs as their low-hopped counterparts, it took longer (especially for Hanseniaspora). They certainly had me worried when they were only at 25% attenuation after a week despite a seemingly quick start. This may have been a result of a factor other than hops (I didn’t precisely measure out the yeast when pitching). In a production environment, pitching an aggressive brewer's yeast in tandem or staggered may be beneficial (although potentially tricky given the killer factor Wickerhamomyces can produce). As far as cross-contamination concerns I don’t have any solid answers, but I hedged and ran them through my sour gear and tap. On the Milk the Funk Podcast about Lactic Acid Yeast my friend Matt Humbard compared the risk to using a Belgian strain noting that standard cleaning/sanitizing will kill them. That’s true of Brettanomyces as well though, but we deal with sanitation, not sterilization in brewing. These two species are found in lambic months into fermentation (The Microbial Diversity of Traditional Spontaneously Fermented Lambic Beer). That suggests that they can grow from a few cells initially in post-Saccharomyces-fermentation conditions, which worries me. What makes a dangerous microbe isn’t necessarily that it is hard to kill (although some are), but rather that it can reproduce and work in difficult conditions. That said, there are attenuative Saccharomyces strain that can cause serious issues. The result were good, but more similar to Lactobacillus with a mild Belgian strain than anything approaching a classic mixed-fermentation. Compared to kettle souring, these lactic acid producing yeast allow for a more streamlined process. No need to heat the wort to pasteurize after reaching the target pH. Although you also don’t have control to “lock-in” acidity as you would in that case. Like a kettle sour, they really don't create exciting flavors, making them best suited for sour beers with big character from fruit, hops, or malt. I recorded videos of the brewing process and my tasting notes. Enjoy below or on my YouTube channel! Apologies for being bad at taking photos and video at the same time. Smell – Fruity, tropical, and lemon-lime. Really expressive hoppiness, without much green. The short dry hop contact time seems to have worked well. Not a huge aroma, but pleasant and fresh considering I brewed it two months ago. Appearance – Has continued to clear with time, despite the wheat and oats. Beautiful golden color. Good head retention for the white moussey head. Taste – A nicely cohesive flavor. Lactic acid is snappy, works well with the hops. Mild peppery-spice in the finish. Mouthfeel – Medium body without any hop astringency. Firm carbonation. Drinkability & Notes – Reminds me of a lemonade, acid and citrus. Easy to drink on a warm evening. Changes for Next Time – Not much to change on this one. Appearance – Clearer, and with more visible carbonation. Good head retention, thanks to all of the protein from the wheat and oats. Taste – The finish comes across stale, likely from the cidery notes. Despite the lower pH it doesn’t taste quite as acidic. Mouthfeel – Medium-thin body, medium-high carbonation. Drinkability & Notes – The yeast is interesting, but more as a novelty in this case rather than something that is able to carry a bland base beer. Changes for Next Time – I’d want to try altering fermentation temperature, pitching rate etc. before writing the strain off. Smell – Less citrus, not as zesty. More fruit punch, maybe watermelon? Some toasty notes. Appearance – The haziest of the bunch. Otherwise similar. Taste – The lemon-lime hop character comes out more in the flavor than in the nose. Less perceived acidity compared to the Hanseniaspora in the same wort. Without tasting the version without the hops I’d think it had a toasty malt flavor, but with the clarity of the other version is seems like THP. Mouthfeel – Similar, medium body. Drinkability & Notes – It’s a good beer, but not quite as quenching and delicious. Changes for Next Time – This is the real drawback of these strains, there isn’t an easy way to lower the pH of this beer without resorting to dosing or blending… unless someone figures out that a certain combination of time, pitching rate, aeration, nutrients etc. changes the expected final pH. Smell – Big cider (bruised apple), a little acetic. Not a great nose. Appearance – I was drinking this a little warmer in the video and it was clear. Hazy after a day in the fridge, which suggests chill haze is at work. Especially good lacing on this one. Taste – Like the nose, cidery. Like the other low-hopped beer the flavor is almost stale. It just reminds me of an old saison in the finish, almost papery-oxidation. That isn’t what I’d expect from a relatively fresh and well-treated beer. Good lactic acid, but the muddy finish prevents it from tasting as bright as I want. Mouthfeel – Thin and a little astringent. Drinkability & Notes – Not a beer I enjoy drinking especially. The flavors are muddled and not especially appealing. Changes for Next Time – It seems, like the other strain, this one needs a boost of flavor and aroma from another source. While it produced a good amount of acid, the other flavors produced aren’t appealing. Mash pH 5.39 at mash temp after 4 tsp of phosphoric acid. A little higher. 4 gallon cold sparge with an additional tsp of phosphoric. Added 1 gallon of water at the end of the boil. Ran off 2 gallons of wort before any flame-out hops (~6 IBUs from the Mosaic). Chilled to 175F and added the whirlpool addition. Ran the rest off, chilling to 70F inline, shook to aerate. Final wort pH was 5.39. No extra acid added to drop the pH. Bases taste dry and tart. 3/21/18 Dry hopped each with 1 oz each of Mosaic and Amarillo. 3/23/18 - Kegged, moved to fridge to force carbonate. 4/7/18 bottled with 50 g of table sugar in 120 g of water (6 ml per bottle). 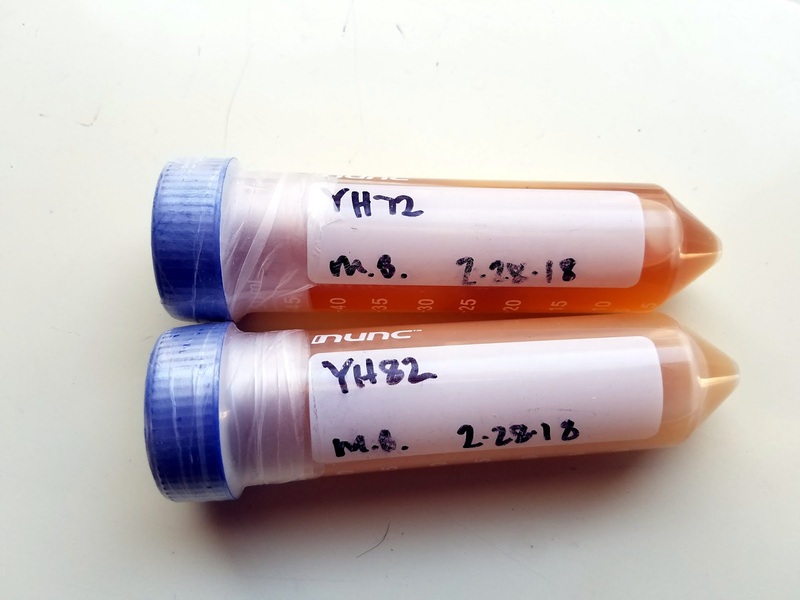 Glad to see you post this - Mainiacal Yeast in Maine is releasing a homebrew Hanseniaspora culture soon, and I'm really excited to give it a go. I'll definitely pla on using it with a more robust malt base than the pale/wheat bases I use for most of my quick sours. I don't get a big toasty flavor contribution from GNO. I'd mostly stuck in the 6-8% range for funky saisons previously, but had gone as high as 17% is a hoppy session ale with good results. Worked well here too I thought. Great article, thanks. Do you have any idea if Hanseniaspora vineae is commercially available to homebrewers anywhere at the moment? Not sure on any readily available commercial source, but I'm sure there will be options soon!